Our two most famous confections, Mamemochi and Mamedaifuku feature carefully hand-selected Hokkaido azuki beans, known for their large size, thin skins and fine aroma. 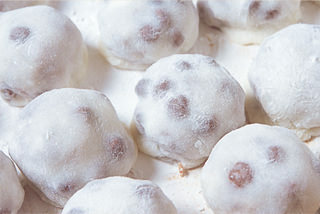 These are boiled using a traditional technique known as “Shibukiri”, and soaked in granulated sugar syrup overnight. Then they’re boiled again at exactly the right temperature and kneaded by skilled artisans so that the bean paste achieves just the right texture – not too soft or too hard. The rice cake coating the thick layer of bean paste contains no additives or preservatives – just a simple combination of sticky rice, salt and water. The sticky rice used is a superior variety, produced only in Japan. Once again, this is carefully kneaded by hand to produce a perfect texture. 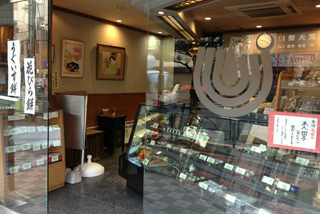 The rice cake is characterised by its special, slightly salty flavour, which comes from the rich, mild salt of Oshima. 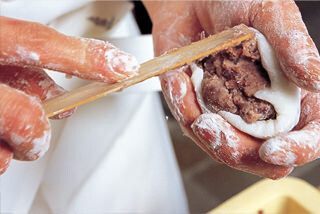 The final important Tsuruse ingredient is the Hokkaido red pea. Raised in a severely cold climate, these large size peas are steamed on two consecutive days to soften their skins, then sprinkled on the rice cakes. At Tsuruse we use a high proportion of peas to rice cake for added flavour. 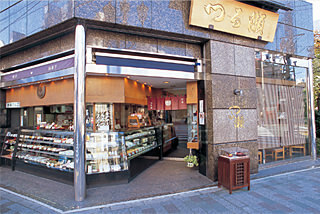 Our special combination of high quality ingredients and the traditional skills of local artisans means that at Tsuruse you will experience authentic Japanese treats – from simple but delicious Mamemochi to the thrilling taste sensation of Madedaifuku.